Thirty years later, the American Composers Forum asked Cage to select a composer to provide music for one of Cunningham's performances in a Minneapolis gym. He died before making the decision and David Tudor stepped in to make the choice. Mark Applebaum, a long-haired college kid, was never the same again. This two disc set brings together Applebaum's subsequent 2005 collaboration with the Merce Cunninghan Dance Company at Stanford University ("The Bible without God") along with other music made since on his electroacoustic sound sculpture — amplified and processed junk hardware, springs, mousetraps and the like — aka, the Mouseketier. Indeterminacy rules in these pieces; stopwatches, chance procedures, and prepared pianos abound, but all is not as Cageian as it seems. It's a seductively dreamy world of floating sonorities and subtle pulses that may inspire you to move with extreme lines and clean geometries. Blasphemy aside, "The Bible Without God" is a testament to being your own authority, living in the moment, and the beauty of everydayness. St. John would surely approve. Mark Applebaum has been nothing short of prolific in the 2000's, with new releases appearing regularly on Innova, in addition to extra-curricular activities on other labels. The Bible Without God is a 2-CD package that feels like two separate releases pulled together with filler material. The problem is easy to guess: at 34 minutes, the title track was too short to be released on its own. And yet, it is the main feature of the album. Taking its name from a comment a critic made after someone suggested that Merce Cunningham's choreographies would be better without John Cage's music, the 13-part suite is a clever homage to the latter. Odd parts consist of live electroacoustic solos performed by the composer on the "mouseketier," the sound sculpture he has been using since 2001. Even parts are short graphic or process pieces performed by Applebaum's Cage class of 16 students at Stanford University, all inspired by or derived from techniques and innovations pioneered by the legendary figure. 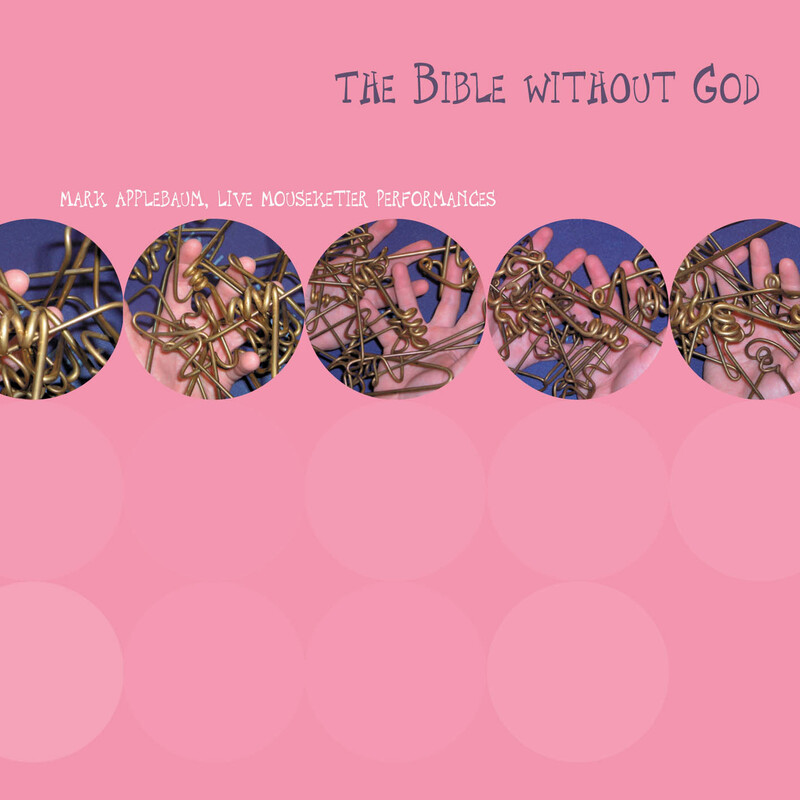 Fascinating, varied and passionate, "The Bible Without God" stands as one of Applebaum's best pieces. Two mouseketier solos round up disc 1: short at seven minutes, "Garden of Memory" is spirited and whimsical, but the half-hour long "Essl Museum" rolls around endlessly, as Applebaum stacks loop upon loop of treated rod-hitting and metal-brushing effects. Here, he sounds like any laptop-wielding improviser. Disc 2 is entirely devoted to solo mouseketier performances again. "Wired Gardens"(16 minutes) establishes a captivating mood, while the hour-long "The Mind Altering Concert" features Applebaum in top shape, developing strong themes, exploring wide dynamics, and constantly moving the performance along sans loops. It might have been better to release these two tracks on their own, and wait for another chamber ensemble piece to pair with "The Bible Without God," instead of going for two discs filled to the rim. Nevertheless, this album contains some of Applebaum's sharpest, most original music.